Gregory Crewdson shot these photographs in and around the same town in upstate Massachusetts, but the scenery varies widely, from leafy summer landscapes to stark, ghostly interiors and – a first for the artist – austere winter scenes. The surroundings and minor details – the light of a distant interior, the glow from a TV set, a highlight on a patch of muddy snow – are essential elements in the picture’s composition, as forceful and significant as any figure. The stillness depicted in each photograph suggests a suspension of everyday life, and yet any hint of narrative or action is deferred by a mood of mystery and incompletion. A man pauses on a wet road in the hazy light of dawn and looks at a modest house; the shopping cart he pushes and the objects it holds are probably his only possessions. A semi-naked couple rest, in post-coital lassitude, surrounded by luxuriant green, with mist rising from the river running in the background. The atmosphere is tactile and moist, the light a substance that seems to cling to the leaves and bodies that occupy the space. The summer photographs bring to mind American realists such as Edward Hopper and Walker Evans, filtered through the damp, saturated colours in the work of eighteenth-century French painters such as Jean-Honoré Fragonard and Jean-Antoine Watteau. The importance of David Lynch and Alfred Hitchcock are evident in the interiors, which have an otherworldly intensity, and paralysis haunts the winter scenes. 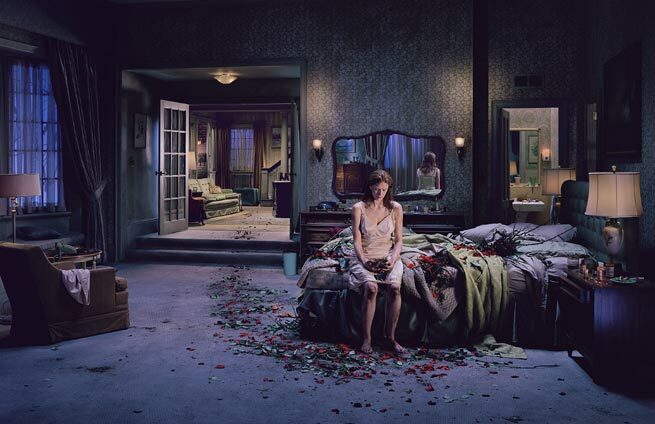 Overall, Crewdson’s vision of everyday America is one of disconnection and belatedness. Gregory Crewdson was born in 1962 in New York, where he continues to live and work. Solo exhibitions include Palazzo delle Esposizioni, Rome (2007), Hasselblad Center, Sweden (2007), Fotomuseum Winterthur, Switzerland (2006), Kunstverein Hannover, Germany (2005) and SITE Santa Fe, USA (2001). Group exhibitions include Walker Art Center, Minneapolis (2008), V&A Museum, London (2006), Mori Art Museum, Tokyo (2005), Guggenheim Museum, New York (2004) and Museum of Modern Art, New York (2000). Gregory Crewdson: Ok, the final step in all this, for the soundstage and location photograph, is post-production. In fact, I joke that I divide my life into three distinct sections – pre-production, production, and post-production. I pre-production, it’s like everything is possible. It all exists in the imagination, so there’s a great sense of expectation and hope and possibility. You can be so ambitious. Production is like combat, sort of. You’re just getting through the day, and then there are moments of beautiful grace, where everything comes together. Then post-production is dealing with the remnants of what you have, in a sense. So in a way, I like that least. Pre-production is great because it’s all about dreaming. Production is great because you’re making it and you’re in it. then post-production is very depressing, because it’s like you’re dealing with whatever residue you have, all the while trying to match those moments of grace. I mentioned earlier that once the 8-by-10 camera is set up on a tripod, it never moves, ever. The main reason for that is we shoot by 8-by-10 film, we shoot a lot of it, and we’ll wind up using different elements from different negatives for the final picture. So if someone came by and knocked the camera, the regisration would be destroyed. The grips actually have created this contraption that makes it impossible to move the camera. When we’re shooting, we shoot forty to fifty plates of 8-by-10 film, and then after everything is said and done, that film is developed, and then we make contacts, and then I’m faced with fifty contacts of essentially what looks like the same exact thing. But while we’re shooting, we’re changing the focus, so we’ll change…I mean, we have camera logs for all of this. So we have very imaginable focus, and then we have every imaginable slight change in light or something. Melissa Harris: How do you do that? How do you get all the focuses? GC: So the camera is stabilized, and so the only thing that moves slightly is the front standard of the 8-by-10 camera. Let’s say we’re shooting through this window. We do a foreground pass, which would be just to focus on this window, and then we would do a medium focus. And then the “hero” focus, and so on…So we have all these things. We will wind up not using most of it. But you have to shoot all of it just in case you need it. So then, later on, in my studio, I’ll look at all these things, and I’ll decide on what’s called the “hero negative”, which is the one that you’re mostly going to use, and then, depending on the situation, there will be four or five otehr elements that you might use, like foreground, background; maybe we’ll change the light in one window. So all those things, those are edited out, and then we make very high resolution scans of those 8-by-10 negatives. Tthat’s when I start working with Kylie Wright. Then there will be months in the studio just looking at a computer screen essentially, and we’ll start integrating all these images. It’s excruciating. We’ll take the foreground from one, and we’ll use the light in a window of another…Basically, it’s all meant to be seamless. I am trying, in a way, to recreate the way I saw. Usually in my pictures there’s nothing out of focus, there’s no blurring, no grain. Anything you associate with anything photographic, I don’t want in the picture. Do you see what I mean by that? MH: I do. But why? GC: Because when somebody is looking at my picture, I want them just to fall into the world of the photograph. So anything that moves against that transparency is too much about the medium. I’ve always said, if I could figure out a way to do this without a camera, I would. So I don’t want grain, and I don’t want pixels, I just want pure image. And that’s a hopeless impossibility. MH: Well, it’s a sort of lik the people who wear tons of makeup to chieve the natural look. GC: Yes, exactly! It is, it’s hopeless. The picture are doomed, in that…my compulsion to make a perfect world looms against the impossibility of doing so. no matter what, you cannot achieve perfect representation. MH: But you don’t mean “perfect” in terms of utopian, do you? GC:No, I mean in terms of the image. But I think that’s where the mystery of the picture comes from- that tension, from the impossibility of that happening while trying as much as you can to make it happen. I also think that every artist has one story they’re telling. I don’t mean a literal story. So it’s like you just…Again, you’re doomed to repeat the story over and over again. It’s their vision… So whoever the photographer is, that’s a constant, because it’s who they are. It’s their history, it’s their trauma, it’s their desire, it’s their fascination, it’s their terror – all that. SO you have the story, that compulsion, and then you have the pictorial form, which is the attempt to take that invisible story and represent it in pictorial form. So it’s that coming-together of form and content, essentially. Then that changes becasue you continue to try to reinvent the for to accomodate the story as much as possible. Of course, in the end it’s impossible to fully achieve the form, becasue the story is murky and undefined. So you try it over and over again, and you’re hoping by the next picture you’ll get it – and that keeps you going. It’s like this unsolvable equation. MH: Would you relate this to photojournalists? GC: Yes, they’re doing their thing like any photographer…If you’re speaking with a great war photographer, the first question you would ask is, “Why are you there? Waht need are you trying to satisfy? What are you trying to record? What is the thing? Why are you putting yourself that close to death?” That’s a compulsion that’s unanswerable. You’re trying to figure out that ultimate meaning. So I would say yes. MH: But for people who want to witness, to document (who have the strong sensibility, perhaps work metaphorically..) sensibility, do you believe that there’s absolutely no concept of real truth in photography or in art, or that conversely everything is true to somebody? Well, there’s truth and there is evidentiary truth, I guess. GC: But I’m a believer in photography and in truth and in photography as a document. I believe in that. I align myself to that belief system, in a certain way. I want to get that moment of truth. MH: “Truth” for you might mean a level of transcendence. GC: But at the end of the day, almost despite the production, despite the artifice, the theatricality, I want at the end of the day tp have something be real there. Or else I’m wasting my time. Richard Prince is a great example because he’s photographing other photographs, but he’s going after something that’s truthful, that kind of weird connection between his own desire and compulsion and something in the culture. In the end, the central story never changes. But the form may. When I look back to my early pictures you first published in the “Our Town” issue in ’92, it’s still the same preoccupations. It’s still that fascination with ordinary life and the uncanny, and that strange kind of coming-together of reality and fiction. All those things are at the core of all the pictures. MH: Is there such a thing as photography any more? GC: Well, it depends how you define photography. For me, yes. Because ultimately, it’s a thing I believe in. The thing I believe in is the still and mute image that is singular and transparent, and is a record of life in some way. So id that is photography, then yes, absolutely. But I don’t limit myself to any kind of paradigm. I believe that you just figure out any tool necessary to achieve the job, and you use it.